She remained standing after I invited her to be seated, looked up for the first time, met my eyes with a spark in hers and informed me: “You have 5 minutes, and then I’m walking out of here.” Under the spark in her gaze was pain, made all the more marked by the deep circles under her eyes. I was wrong; we had quite a bit in common. As I worked with Dannie, I came to know of her struggles with addiction – to alcohol, to prescription drugs, to family conflict and to abusive men. Her present boyfriend was soon to be released from prison, and the rescuer in her struggled with letting him back into her life. I reminded her that if that was her decision, she risked losing the progress she had made with staying sober, not having another suicide attempt (she had two prior to our meeting) and remembering that she, as a human being, had value and worth. I so hated to see this strong woman – the one who told me that this boyfriend was better than some of her others because “he always made sure to hit me where no one could see it” – lose ground in her healing and recovery. But I believe in the autonomy of my clients – and Dannie needed to feel in control of something, even though I believed that taking control in this instance would be to refuse his coming back to live with her. Life, like therapy, is never without setbacks, and a new concern was a health issue that flared up, with a prognosis that offered only maintaining her present health and not letting it decline, rather than any type of cure. Coping with that, along with the depression, addiction and everything else, became a daily task. One day, in Dannie’s latest update on her continuing family conflicts, she asked my opinion about something. Apparently when Dannie went to her mother’s grave site, she saw a wrought iron angel lawn ornament stuck next to the headstone, the word “Welcome” in big letters. Dannie was horrified and appalled, especially since she found out later that it was her very own sister who had put bought this for their mother, when her sister had a few too many beers. Dannie removed it and threw it away, only to return a week later to find another one in its place. She looked at me, at once aghast, angry, yet expecting no less from her family. Then, I saw it – the faintest gleam in her dark eyes, that fiery spark that only Dannie had after a life filled with 10 kinds of despair. The edges of her mouth curved up a bit, and she looked down at the floor. But I could see her shoulders start to shake. I couldn’t help it – this therapist started to laugh, struggling to keep it private, since Dannie wasn’t looking at me. Her eyes met mine and we both burst out laughing at the same time; a rollicking, easy, raucous laughter that, I found out later, had quite a few of the other offices in the hall wondering what in the world was happening in Theresa’s office. Dannie and I were bent over, laughing, until tears ran down our faces. An angel in a cemetery – okay; but a welcome angel? The absurdity of it caught us both, and in that moment, for Dannie and me, there was nothing else but our sharing joyously in something macabre, yet somehow, in some way, making sense in the larger scheme of things. It felt good and it felt right; it was beautiful. We collected ourselves, then were able to segue perfectly into her own fears about dying, a topic which she had always skirted in the past. Unexpectedly, I left that job to take another position that I felt called to, and with a month until my departure, I said my goodbyes to Dannie. I felt certain she would be in good hands with the therapist assigned to take over her case. Our 5 minutes that turned into a few years was done, and I was proud of her progress and transformation. When she thanked me for saving her life, saying that she’d never forget me, I answered that she did the work, and that it was a privilege for me to have been part of even a small portion of her life journey. 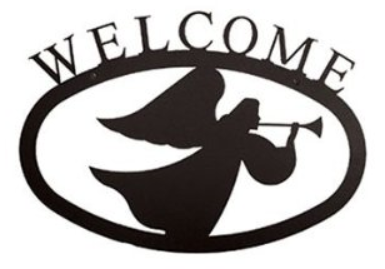 I also mentioned that whenever I saw a wrought iron welcome angel, I would think of her and the laughter we shared. Not long after, I heard that Dannie had passed away. “Oh no…” My sadness was immediate. I was afraid to ask, but I had to ask, how she died. A suicide? No. An overdose? No. As a result of physical abuse? No. The answer – “of natural causes” related to the condition we knew about. Her body shut down; it was time. I breathed a sigh of relief. At the time of her death, Dannie was sober and still living on her own, having refused to take back the abusive boyfriend. It was unfortunate, but it was a good death. Yes – a good death. Thank you, Dannie, for the gift of your generous and strong spirit. You mattered. You made a difference. You shine in my heart, and in my memory. Somehow, I think the answer to that is yes. This entry was posted in Humor & Pathos, Personal Musings, Thursday Re-View. Bookmark the permalink. Thank you for sharing this beautiful story. One of the most beautiful things in life is the real connection of one human being with another. Your story serves to emphasise this point. What a shame that connection couldn’t have come so much earlier in Dannie’s life so the quality period would have been so much longer and maybe she could have carved out a proper life. Ahhhh, what Mark said, Theresa! This is such a lovely story. Thank you for sharing…. Oh Theresa, what a beautiful story to read first thing in the morning! Thank you for posting again. You’re so very welcome, Judy. Sometimes the greatest gifts come from those we reach out to help – the ability to recognize those gifts and accept them is what makes you so special. Thanks for sharing! So true; meeting Dannie was a privilege. Beautiful post. It’s wonderful that you could touch another life in such a positive way and touch so many others in the sharing of Danni’s story! Thank you for helping to remember Danni. Welcome! With your support and patience, along with Danni’s dissatisfaction with and determintion to overcome her circumstances, she was called home in the state she desired and not the one imposed upon her. She has Fought the good fight and bore her trials well. The therapeutic good laugh she had over a misplaced welcoming angel in a cemetary, was only a small sample of the joy she now experiences among rightly placed angels. I don’t know if there are words to describe such a deep and sincere connection… yet, you’ve written in a way that makes all of us just know what it must have been like to make that connection… God bless you! Thanks for sharing these moments you had, as they’re reminders of the humanity and grace we all share. Isn’t it wonderful when those laughs bubble up, when together we realize the absurdities in life? It is, indeed, Sacred Ground, Vincent. Thank you.